Comp starts at 11:00 am for day 6. Competition is confirmed today Thursday, October 19th at 11:00 am. You can see it live through our APP Fronton King. Today we started with the “main event” we already have round 1 in the water. Already live on APP Fronton King, Facebook and YouTube. 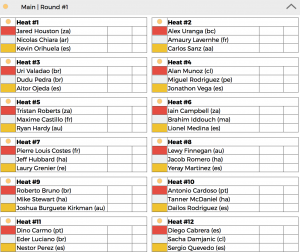 We are done for today with the entire draw for main event filled up, check Round 1 draw, intensive heat for tomorrow. Check in tomorrow at 9:00 am. We are Live on our new Fronton King APP available for IOS and Android. We started the fourth day with the triales finals and we are very likely to start with round 1 of the "main event". Spectacular waves again in this new edition of the Gran Canaria Fronton King Pro 2017 in the municipality of Galdar, Gran Canaria. Today has finished the round 2 of triales with the best conditions, spectacular day today. With a 10-foot swell The Fronton has tested all Trials riders on rounds 1 and 2. Forecast for tomorrow looking even better with a solid ground swell even bigger than today but with a better direction. Nelson Flores of Chile was crowned world champion mathematically when the Eastern Island Cristobal Fernández did not get through the quarterfinals. A great year for Nelson who competed in all the events of the tour deserving this great triumph in the best event of the year, the Gran Canaria Fronton King Pro 2017 # fk17. Pro Junior – The young local WIly Lujan wins and Nelson Flores proclaims world champion. The young promise of the municipality of Galdar Wily Luján with just 16 years wins the first edition of Pro Junior Gran Canaria Fronton King eliminating Nelson Flores who was crowned world champion mathematically.